With one exception, we’re sticking to the early 1970s this week for our Vinally Friday showcase. Last week Alanya featured Jerry Garcia’s first solo album; this week Craig will spin Grateful Dead bandmate Bob Weir’s first solo effort, Ace. 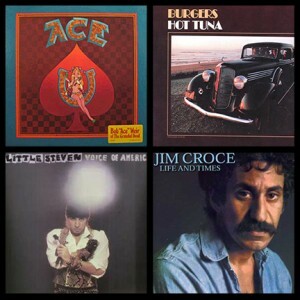 Released in 1972, Ace is essentially a Dead recording in everything but name, and most of its songs became staples at the band’s shows for decades to come. Alanya will stick with 1972 – and with the Bay Area sound – with Hot Tuna’s first studio recording, Burgers. Hot Tuna was formed in 1969 by members of Jefferson Airplane while vocalist Grace Slick was recovering from throat node surgery. Burgers was the band’s third album, but their first that wasn’t recorded live. Robert will jump ahead a decade to feature Steven Van Zandt’s first solo project, Little Steven & the Disciples of Soul, and their 1983 album Voice of America. Van Zandt left Bruce Springsteen and the E Street Band that to go solo. The highly political Voice of America cut was his new band’s second studio effort. Finally, Tommy will rewind back to 1973 to play a little bit off of American singer-songwriter Jim Croce’s fourth studio album, Life and Times. Croce won two Grammy’s for the album’s most popular cut, “Bad, Bad Leroy Brown.” No telling whether Tommy will include that in his vinyl throwdown! Finally, it’s Friday! It’s Vinally Friday, on the Trail 103.3, brought to you by Pella Windows!